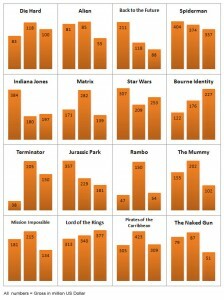 Below you find two charts which visually show US gross revenues of the first three movies of some well-known franchises and every movie of some well-known trilogies. Of course there are still some missing ones, like SAW, but I promise to deliver them, when I have another list of 16. Nevertheless. thanks to the visual simplicity of such graphs and bars, there are many surprising things that come to the surface. For example, there is the result of the STAR WARS franchise not doing as well as I would have thought. The more I think about it the more I am surprised. 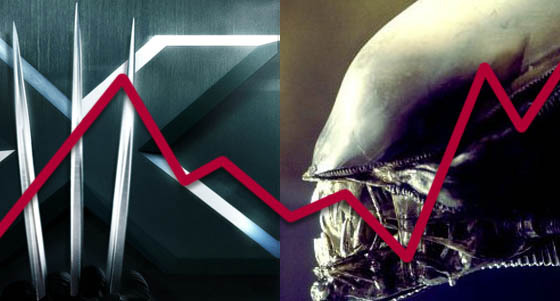 The franchise is basically the geekdom of heavens yet the second movie earned less money than the first. Was the second movie to serious or the first one not good enough? I don’t know. But the jump from second to third movie is very interesting, because the second installment is seen by many as the best one of the first three. 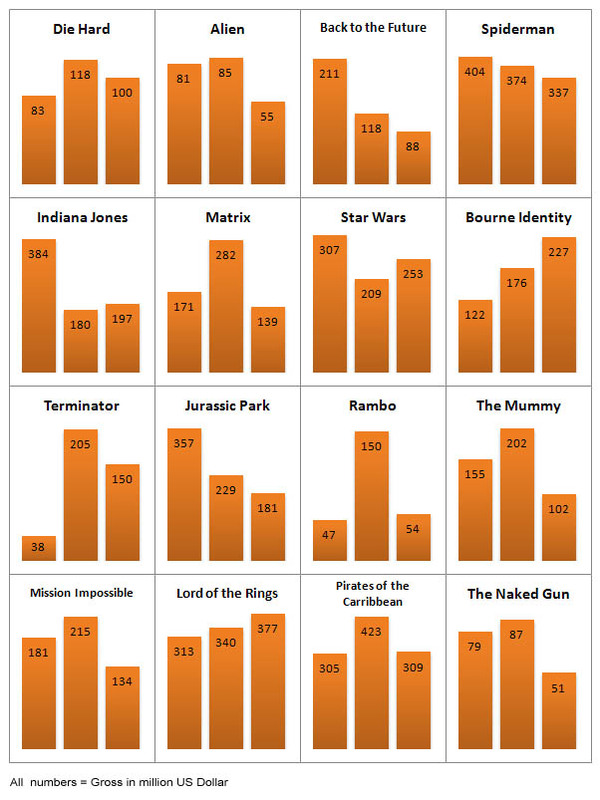 Another jump to the bottom is visible for INDIANA JONES, even more so than STAR WARS. From a quality perspective this doesn’t come to a surprise to me because the second movie was by far the worst adventure for the whip wielder. On the bright side, the TERMINATOR franchise can be proud of itself since the increase of gross earnings from the first to the second movie is truly mesmerizing and no other big franchise (except for RAMBO coming close) ever managed to do that. On the other hand, this series also suffers from what I call the “Franchise Peak” where the second movie of the trio is always the best selling incarnation. 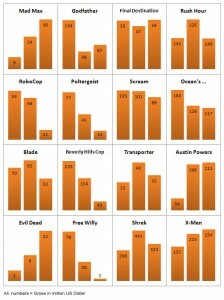 Besides TERMINATOR you can spot this peak amongst others for RAMBO, MISSION IMPOSSIBLE, NAKED GUN and SHREK. Out of all of the 32 franchises and trilogies six of them managed the seemingly impossible to earn more money with each sequel. X-MEN, AUSTIN POWERS, BOURNE and LORD OF THE RINGS could be called the Big Four, while EVIL DEAD and MAD MAX would then be the Small Two. But again, not everything is nice and wonderful in the world of sequels. While there are six winners, there are also 9 looser. In other words out of all 32 analyzed series 28 percent of them made successively less money. Some of them were lucky as SPIDERMAN, where the money flow didn’t drop that drastically. Yet, there are also those which fared horribly during their whole lifetime. BEVERLY HILLS COP is one of them, as is POLERGEIST. 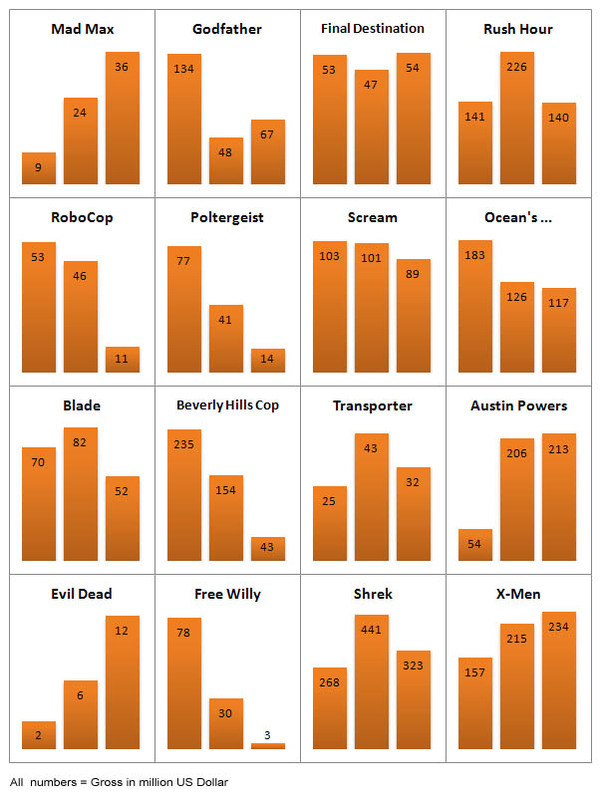 And the then there is FREE WILLY which fall is second to none: no other trilogy or franchise managed to earn 26 times (!) less money at the end compared to its beginning. So, as you can see, there are some nice tidbits that came to the surface and some of the were truly surprising. Did you spot anything you never thought of?